Integrated Health & Wellness Centre is pleased to offer our patients custom bracing that is comfortable, lightweight and clinically proven strong and supportive. Custom braces are usually covered through your Insurance company. Dr. Spyros Karelis specializes in custom knee bracing primarily prescribed for ligament(s) instability and osteoarthritis of the knee(s). Dr. Karelis also specializes in ACL bracing, Osteoarthritic bracing (bracing for arthritis) and braces for the rest of your body. Dr. Karelis enables his patients to regain and maintain the joy and comfort of natural motion with custom braces. Integrated Health & Wellness Centre carries the best clinically proven custom fitted braces from DonJoy to accommodate any lifestyle and sports specific activity. Dr. Karelis also provides low-profile designs that fit comfortably under your sport equipment/uniforms or clothes. 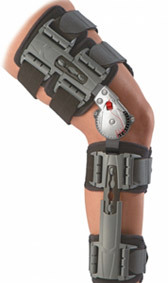 DonJoy features a wide selection of bracing products for both prevention and recovery. Dr. Karelis will determine the appropriate bracing solution for your specific needs. For more information about custom bracing or any of our chiropractic or specialty services, please contact us today!